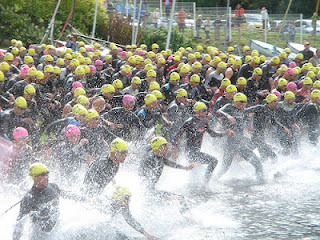 So I thought a lot this weekend about this awesome bubble of triathlon and racing I live in. While down at Quassy I was surrounded by and even talked with WORLD CLASS athletes. Then there is the literal sea of people you are surrounded with at races that are your weekend post work warriors- those of us that work the 9-5 job and still somehow train and compete in events. Looking around at the people around you at an event like Quassy it is hard to believe that the United States has an obesity issue! My twitter feed is full of other people just like me who train countless hours- enough for some people to consider it a second job. The other thing I love about triathletes (more than any other race I am in) is the encouragement. From the caring about each other while setting up transition to words "you look great!" out on the course. It is really nice to be surrounded with this bubble that reminds you people actually do care about other people. But man a step away from the race course I am reminded of the reality of the society I live in, the harsh real world. A world where I get beeped at and nearly run off the road by people every day- not just while on my bike. Where I rarely get so much as a Thank You for holding open a door. A world where EVERY ONE is special- can't single anyone out as being better than anyone else. Where we can't keep score in soccer games because there can't be a winner and a loser. I am quickly reminded in the real world of the obesity issue in this country and the harsh reality of the health problems it causes. Today I read a great article about a teacher who told his students the truth- "you are not special." I have to say I am glad to hear someone telling the next generation the truth! I really would give anything to live in the triathlon bubble. Maybe make my own world filled with other athletes who care about themselves and the people around them. Where it is okay to have someone win and someone else not take home a medal. I think that is the society I want to be a part of! At least for now I can visit it now and then and have my faith in humanity restored!